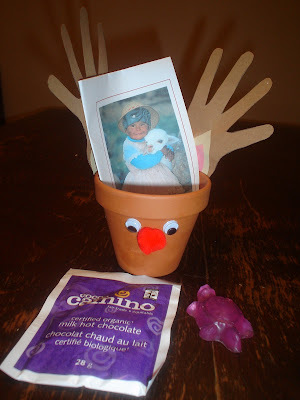 On to some of our wonderful gifts..
Homemade reindeer pot by Brandy's youngest daughter, hot chocolate, homemade soap by her eldest daughter, and a donation made in everyone's name to Heifer International. Amanda's "Movie Night In", I just made up the name but I think thats the concept lol. 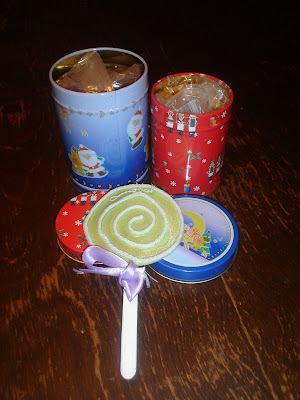 Popcorn and hot chocolate in pretty tins for a movie night, and an adorable homemade decoration. 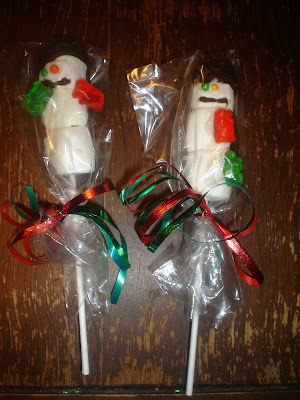 And part of Beckies, homemade marshmallow snowmen on sticks, very cute. The kids ate the chocolates that were in there too LOL! Then some homemade decorations as well as color-it-yourself ones too. And of course the t-shirts that Melissa made, but those are on the kids blog cause the kids are in the pictures, so I won't post it here. I am still pouting that we couldn't make it tonight to Calgary, glad we didn't as Mr K just woke up with a hacking fit at 9:30. He is sleeping with me in our room with the window open a crack and the humidifier going, nice cool,moist air for him to breathe in. I don't think Jen would have appreciated that in her house LOL. Good damn thing I bought myself a pair of fleece pj's from Superstore, I am toasty in there with him. Hope you are all having fun without me. Send pics! Maybe I will be down for New Years.....not that we ever make it to midnight HA! you are supposed to make popcorn, drink hot chocolate and play thomas uno :) movies work too! I wanted to do a family-themed gift, something you could all do together. Ivy can manhandle a few cards, they are pretty tough or give her an old deck of her own from the Reuse centre. Damn, why didn't I think of that earlier?? OH duh, I tucked away the Uno game LOL so Ivy wouldn't wreck it, that's right! Sheesh, my mind.